This is the way that pennant races are born. Say you’re a talented team from an industrial city in the Midwest. You come out of the All-Star break with a nice little 7.5-game lead over another talented team from an industrial city in the Midwest, which comes to your stadium — the one with the baseball-themed Ferris wheel, and the giant cement carnivores overlooking everything — and promptly beats you in three straight. This, plus the fact that your ace, one of the two or three best pitchers in the game, has been slightly off the rails of late, sends your fan base into a right funk. Then, on Sunday, you get bailed out, 5-1, when a young left-hander takes a no-hitter into the fifth, and you go off to Arizona with a 5.5-game lead, not the dodgy 3.5-game margin that might have been, and your ace tries to get his wheels aligned again Monday night. And that is how the Detroit Tigers and the Cleveland Indians probably are going to chase each other through the American League’s Central Division for the rest of the season — because a baseball season is very long, and you always have your ups and downs, and you play them one at a time. This week’s reading is from the First Epistle of Nuke LaLoosh, Chapter 1, Verses 1-3. At this time of the year, the clichés are always ahead of the action on the field. On Sunday, the Tigers were rescued by Drew Smyly, a young left-hander who put a charge in the afternoon by shutting down the Indians without a hit until Yan Gomes dumped a double into deep center field in the fifth. (Gomes later parked Smyly in the seats for Cleveland’s only run.) Two outs before that, right fielder Torii Hunter had run down a sinking line drive off the bat of Cleveland’s Ryan Raburn, and you could feel the ballpark take on an edge as the parts to the inevitable highlight package seemed to be falling into place. Hunter’s play was going to be the one that Saved the No-Hitter. The general feeling definitely included Smyly himself, who departed from this week’s scripture to be very honest about things. Until Sunday’s finale, the Tigers had looked very bumfuzzled. In the first three games of the series, they were outscored 20-7. They were helpless with men in scoring position, and their right-heavy lineup couldn’t deliver against the left-handers on the Cleveland staff. The series began with a 9-3 drubbing Friday night, and then Detroit dropped both ends of a day-night doubleheader Saturday, the futility reaching a crescendo when its closer, Joe Nathan, gave up a three-run double in the ninth inning of the second game to Carlos Santana, who never recorded for Motown, at least to my knowledge. Only Smyly’s work Sunday kept Cleveland from a historic four-game sweep of the Tigers in Detroit, and this is a rivalry that goes back far enough that the first game stories consisted of cave paintings along Trumbull Avenue, drawn there by the warring clans of Lajoies and Cobbs back in the dim times. These are two teams built to compete against each other, which should liven up the rest of the season. They both have a terrific mix of young talent and veterans. The heart of the Detroit batting order, Miguel Cabrera and Victor Martinez, is enough to put the jumps on any pitching staff in the league, while J.D. Martinez, who follows them, is hitting .330 and having a legitimate breakout season. Meanwhile, the Indians have managed to stay close, and above .500, despite some truly abysmal hitting — Nick Swisher, in particular, looks as though he’s got about 11 voices in his head telling him what to do up there — and some serious injuries to people like pitcher Justin Masterson. They’re doing it with spare parts, which is the way things work in a pennant race. Somebody you never heard of gets hot. Somebody forgotten gets famous again. If there’s one thing we can thank last year’s world champion Boston Red Sox for, it is the return to baseball of the real beard. None of this faux-fringe stuff. No more with the scruffy goatees and the thin jawline tracings, but rather genuine Old Testament prophet/Civil War general foliage that you have to trim with a Weed Eater, a place where barbecue sauce can be stored for weeks in times of famine.1 Other players have followed suit. 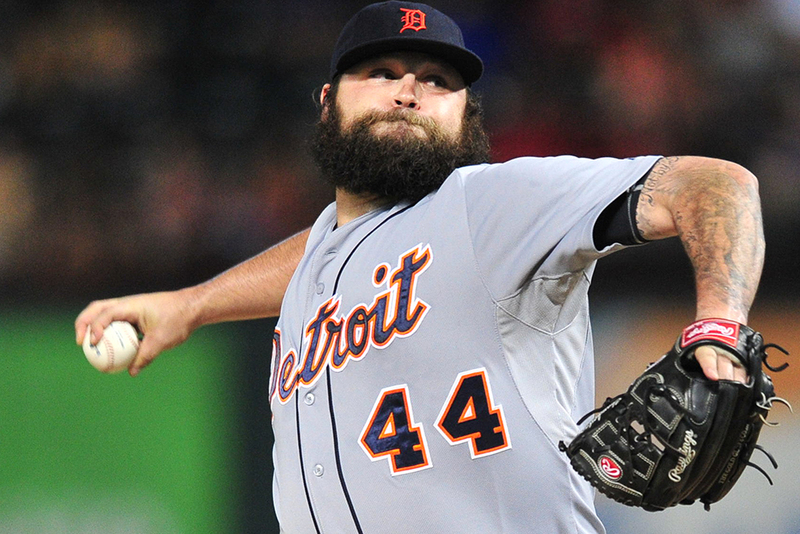 In the Tigers clubhouse on Sunday, Joba Chamberlain looked very much as though it was time to toss a little chin music at Pharaoh. “First draft?” he said. “It’s the only draft. I never could grow a beard before.” He’s learned how now. Once, he was a sensation, and he was a sensation in New York, and he was a sensation as a New York Yankee, which is the triple crown of baseball phenomhood. Chamberlain exploded in 2007, striking out 34 batters in 24 innings. The problem was that the Yankees didn’t really know what to do with him. He started. He relieved. He did both at the same time for long stretches. The Yankees tried to use him this way while simultaneously limiting his pitch counts, which was genuinely strange. (The “Joba Rules” quickly became a #hotsportstake on the back pages of the tabloids and on the airwaves.) Chamberlain was a talent who was being used for all practical purposes as a journeyman, and it became an untenable situation for both him and the Yankees. Then he started to get hurt, including a garish ankle injury suffered in a non-baseball-related trampoline accident. By 2013, the relationship had soured completely. Joe Girardi clearly had no use for him, and Chamberlain couldn’t get innings. He signed with the Tigers for $2.5 million last offseason and immediately felt at home. “He’s the one piece in the bullpen who’s been consistent all year,” Ausmus said. The wild card is the man who wasn’t there this weekend. Justin Verlander was waiting to pitch on the road in Arizona, but there wasn’t anyone in Detroit who didn’t know that the season might turn on whether he can recover from what has been, by his standards, an off year. Over the first half of the season, Verlander went 8-8 with an ERA that was nudging five. It has been a down season on both the macro and micro levels; as John Lowe pointed out in the Detroit Free Press, with two outs and runners in scoring position, the classic situation for a shutdown starter, opposing batters have gone from batting .178 against Verlander in 2012 to batting .305 against him this year. He has spent the last month tinkering with his delivery, and Ausmus gave him this week off to recover, which is a bit counterintuitive, at least to those grizzled baseball folk who believe that the way to improve your pitching is to pitch. Many of these grizzled baseball folk are former pitchers who walk around today with an arm that looks like an open parenthesis, so what do they know, anyway? The two teams left Detroit for long road trips, the Tigers to Arizona and Los Angeles, and the Indians to Minnesota and Kansas City. The pennant race, a brand-new thing produced by the events of the weekend, went with them. They will play these games one at a time because it is a long season and because nobody’s found a way to play ’em two at a time, or at least not a way to make a buck off of it. All of which reminds me that Gettysburg is the greatest beard movie of all time, surpassing not only every biblical epic, but also the films of Sergei Eisenstein. For the entire four-plus hours of the film, Tom Berenger appears to be balancing a young yak on his chin.